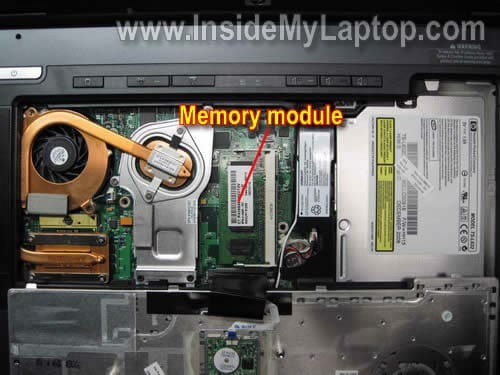 In this guide I explain how to upgrade RAM in HP Compaq nc8430, nw8440 and nx8420 notebooks. In my example I’m using a Compaq nc8430 which came with 1 GB (two 512MB modules). This model can take up to 4GB total. 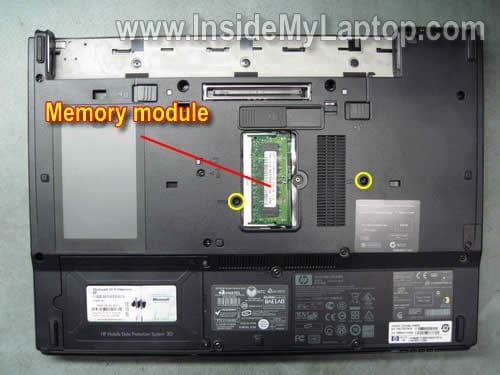 You can install up to 2GB memory module into each slot. HP recommends using PC-4200 DDR2-533 SODIMM. If you cannot find PC-4200 DDR2-533 memory, you can use PC-5300 PC-6400. They should work. These notebooks have 2 RAM slots available. One slot (external) can be accessed through the door on the bottom. 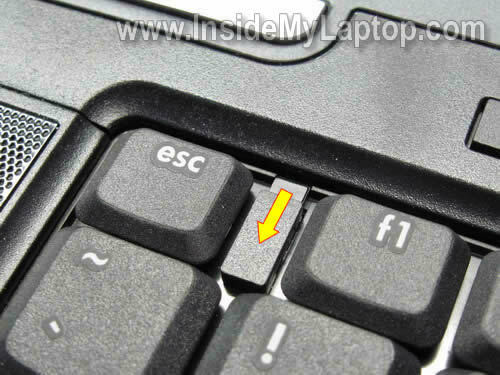 Another slot (internal) is hidden under the keyboard. Before you start taking it apart, turn off the computer and remove the battery. Remove the RAM door from the bottom. Upgrade existing 512MB module with a new 2GB module. 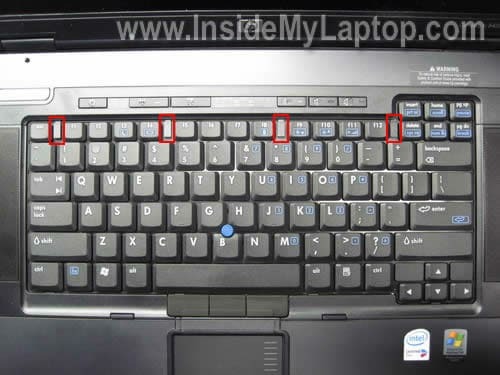 In order to remove the keyboard, you’ll have to remove two screws on the bottom. These screws are shown on the following picture. 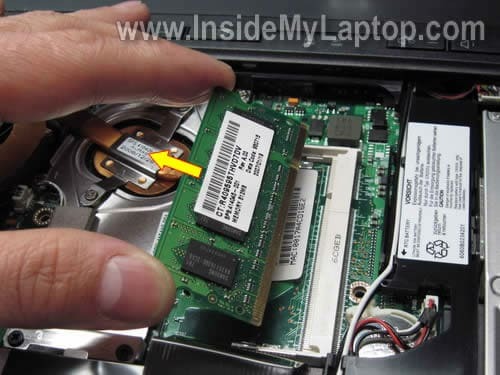 Use a T8 torx screwdriver. 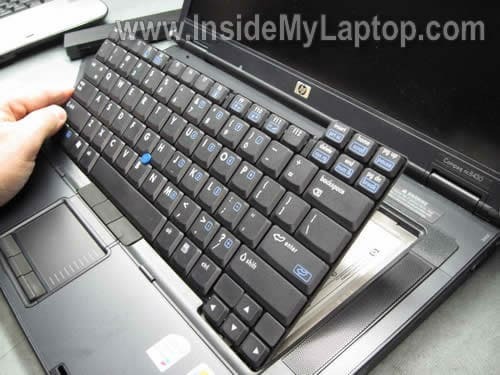 There are four retention tabs securing the keyboard to the notebook case. Slide all four retention tabs towards the touch pad. The keyboard is connected to the motherboard. It’s not necessary to disconnect it order to upgrade RAM in the internal slot. Now you can access the internal slot. Remove existing 512MB module and replace it with a new 2GB module. That’s it! Assemble the notebook back together and turn it on. New memory will be detected and configured automatically on the first reboot. Thank you for this very helpful information. I would make a donation to you but I’m a little leery about using my credit card. If you would send me information where I could send a check, I would be glad to do that. Could you explain how to remove minipci card of NC8430? I would like to change it and plug a minipci ssd. Could you explain how to remove minipci card of NC8430? 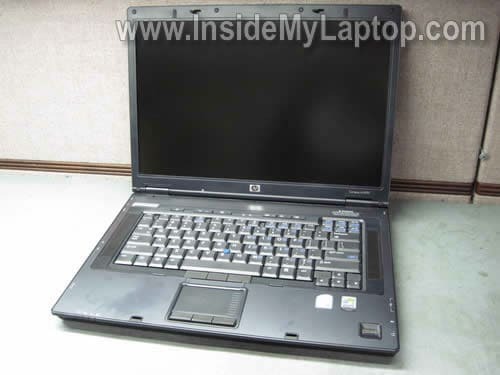 Take a look at service manual for NC8430 notebook. The manual has step-by-step disasembly instructions. They start at the page 5-1. Wonderful information. I was almost to brake my Laptop. Then I found this instruction and 5 minutes later the Laptop was running again with 3 GB. Below the keyboard a 2 GB modul and on backside a 1 GB modul. Great tutorial. I have one a compaq nc8430, but it seems wireless are failing. I have been wondering if I should keep the old laptop or get a new one. It still runs fine with everything else. Did you notice any difference with 4GB installed? The CPU is still fairly decent by todays standards.